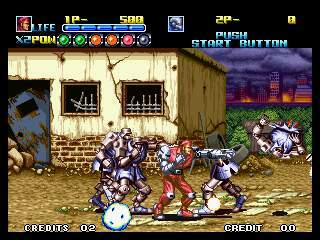 Robo Army is an early beat'em up for the Neo Geo. While it has graphical problems, its still a decent, inexpensive filler game for a neglected genre on the Neo Geo. Something about an invading army of robots attacking the world. With conventional forces on the run, the US is sending two "robots-humans" (well, actually they're cyborgs, but don't tell the programmers) from the 64th Robot Division to take them down. According the manual they are being sent by the UN, and there are hundreds of robots on the 64th Robot Division. Why on earth we only sent two is beyond me. Regardless, the two lucky contestants are Maxima and Captain Rocky. Other than the title screen, which hits a new low in bad title design, the graphics are pretty standard fare for the early 90s Neo Geo. While I have no proof, I think that early Neo Geo artists were paid by the number of colors they used. Thusly, there is an abundance of color; it nearly teeters into kitsch, but not quite. There are several technical problems with the graphics: the scaling effects are pathetic and choppiness is abound, but the nadir is the black-bar status section on the top of the screen. This is the only Neo Geo game to include this memory saving layout that was last prevalent on the Sega Genesis (up until the release of the SNES). 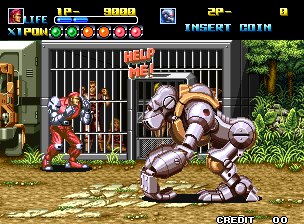 It feels like the programmers were really rushed to get Robo Army out the door, and graphics took the hit. With some polishing it could have been much better. Incidentally, no one on the programming staff seemed to notice that Dr. Jeed's daughter is a blonde-haired Caucasian when you rescue her, but then suddenly a Japanese girl in the ending graphics. Ah well, at least they didn't resort to terrible voice acting. So-so, nothing great. The sound effects include convincing metal clanks, but the voices are very muddled (partly because they are supposedly robotic, partly because the samples are bad). It is a little weird to hear the same digitalized helicopter sample from NAM-1975 (and every other game from that era). The level one music stands out as the only notable track: It samples several digital voices, and although they are muddled, they actually work in a strange retro-future manner. The controls aren't perfect. They feel almost intentionally robotic, your character clunkily moves around punching and executing the most ungraceful jump-kicks I've ever seen (fitting since they're 400 lb. robots). The high light are the three levels of super-attacks your character can do based off of how much bonus energy you've saved. Both Maxima and Rocky have different super-attacks, which adds a bit to the replay. If you collect a certain power-up, your character will turn into 'Power Buggy' mode: becoming an invincible SUV wrecking-ball that can run enemies down. How these robots can defy physics to turn into giant SUVs baffles even today's scientists. The gameplay itself is pedestrian. Just walk forward and tap the attack button as fast as you can. This works against nearly everybody. A few bosses and enemies can be dispatched by the awkward jump kicks, but mostly you'll be running around punching and jumping over mines. 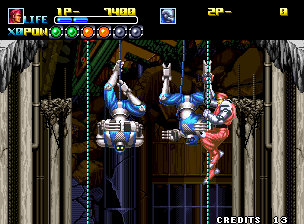 There are a few cheap hits on the rope segments, and I think a few of the latter bosses were designed to munch on quarters. In keeping in the time honored video game beat'em up tradition, all the bosses reappear for one last, final-level bash. All in all, the game is very short (6 brief levels), so you don't play long enough to get really bored with it. This is the kind of game that you play once or twice by yourself, then put away for a while. If you're into beat'em ups, it may come off the shelf more frequently, although there are many better games in the genre (but not too many on the Neo Geo). It's strength is its brevity. This game will probably find most of its replay in quick 2-player sessions. Obviously, someone at SNK really liked this game. How else do you explain Rocky's reappearance in King of Fighters 2000? It isn't surprising: Graphical problems aside, it really isn't that bad of a game -especially for the low prices it goes for. While it isn't a great game in any category or genre, it's one of those little games that slogged through the trenches of your local arcade -doing exactly what is was supposed to do, nothing more, nothing less. Bobak! : made his way through college on a backgammon scholarship. He would have gone pro, but an alleged 'loaded dice' incident has marred his chances of getting onto the pro circuit. Now he teaches beginner through advanced backgammon at the 32nd street Y in Manhattan. He hates checkers and doesn't care that its on the other side of most backgammon boards.